Although born and raised in Canada (Vancouver, Gabriola Island and rural Nova Scotia), Kristin Janz has lived in the Boston area since 1998. She enjoys reading and writing within many genres, including fantasy, science fiction, historical and literary, but is particularly fond of high fantasy, especially those multi-volume series of 800+ page novels that everyone loves to mock. 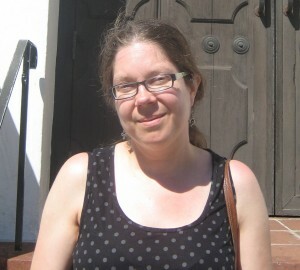 Her fiction has appeared in several publications, including Escape Pod, Daily Science Fiction, and On Spec (for a complete list, visit her website at www.kristinjanz.com). Kristin is a 2008 graduate of the Clarion West Writers Workshop. Along with her husband, Donald S. Crankshaw, she is a co-editor of online magazine Mysterion, featuring speculative fiction stories that engage meaningfully with Christianity, although not exclusively from a Christian perspective (www.mysteriononline.com). In 2016, they published the related anthology Mysterion: Rediscovering the Mysteries of the Christian Faith.